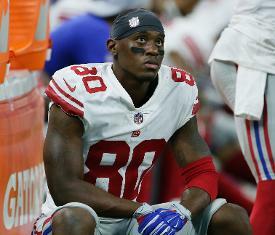 The New York Giants placed wide receiver Jawill Davis on injured reserve Saturday, NFL Network's Ian Rapoport reported. According to Rapoport, Davis "suffered a dislocated patella while dancing in the locker room." NJ Advance Media's Matt Lombardo reported earlier Saturday that Davis got hurt while "horsing around." Davis, who signed with the Giants as an undrafted free agent, has appeared in seven games this season, notching four receptions for 40 yards. The 23-year-old spent most of the year as a return specialist. He averaged 7.4 yards on 12 punt returns and 24.4 yards on seven kickoff returns. Rapoport reported the dislocation was "said to be slight," so the injury may not disrupt Davis' offseason training.